It is a positive logic electronic model,with 5v DC power pin, GND pin, and digital output pin. It is powered by 5V DC, and has dual output (analog and digital). If nothing stop the infrared illumination Photosensitive three Aurora, it output a low voltage; on the contrary, output high voltage. I notice a very innovative design which based on Hall Effect Hall-Θ, it's very cool. 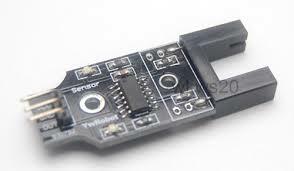 At same time, I found a solution that is use the reflective type infrared sensor and analog Comparator Amplifiers.